TimeTrack watches the file system to automatically track how much time you are spending on each of your projects. By default, TimeTrack is configured to watch your home directory. You will likely want to reconfigure TimeTrack to watch whichever directory you use to store your projects. After installing TimeTrack, run timetrack config to find the User configuration file. Edit that file to configure TimeTrack to watch the appropriate directory (or directories if you have multiple, note that at this time TimeTrack does not support watching directories which are nested within one another). 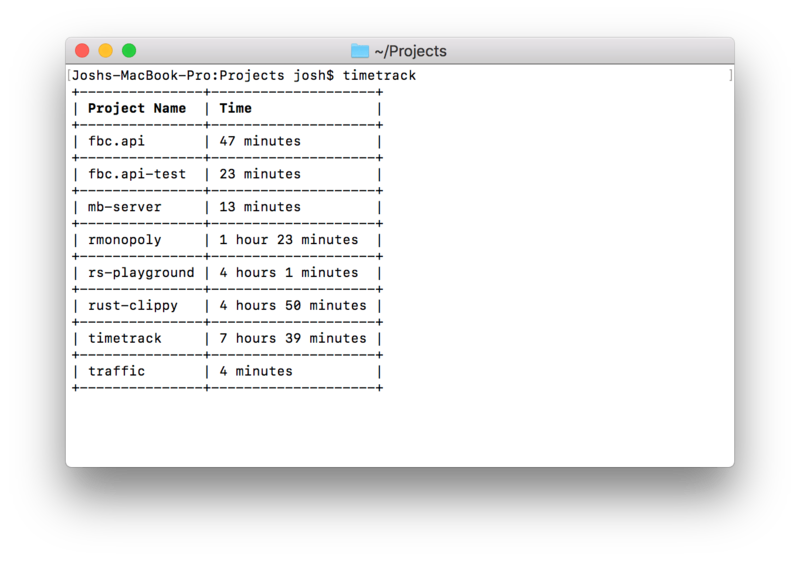 As an example, the full contents of my TimeTrack configuration file are track_paths = ["/Users/josh/Projects"]. After editing the configuration file, run timetrack config again to confirm the Tracking paths are displayed correctly. The timetrack track command starts TimeTrack in tracking mode. This should be running any time you want to track time. While you can manually start/stop this process, it is recommended that you configure your system to start this process automatically on startup. The specific steps to do this will depend on your OS. On OSX you can use timetrack schedule after TimeTrack has been installed to configure it to start tracking every time the current use logs in.